The paradox of toil states that under certain conditions if people wish to work longer hours, this can cause falling real wages and rising unemployment. The paradox is that individuals have an incentive to work longer, but if everybody wants to work longer hours, it can actually cause unemployment. How does the paradox of toil work? Suppose that due to falling living standards (e.g. falling real wages) everyone wants to work more hours. This will cause an increase in labour supply and a fall in the wage rate. Falling wages lead to lower inflation expectations and falling prices (deflation) as firms can cut the price in response to lower wages. Because nominal interest rates can’t fall below zero, deflation causes higher real interest rates. Higher real interest rates in a depressed economy reduce aggregate demand further, leading to lower real GDP. With lower real GDP, firms see less demand for their goods and therefore demand for workers declines. If there are falling wages and lack of aggregate demand – increasing supply will not solve the problem. Say’s law definitely doesn’t apply in these conditions. 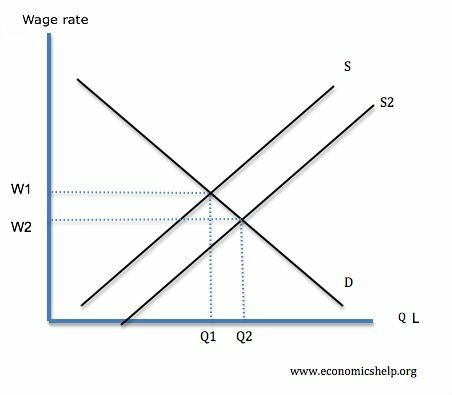 In the classical model, the assumption is that unemployment is due to wages above the equilibrium (real wage unemployment). However, this theory suggests that cutting wages may not solve unemployment because cutting wages causes demand deficient unemployment. A rapid fall in prices caused by falling commodities could actually be contractionary – if the falling commodity prices cause deflation. 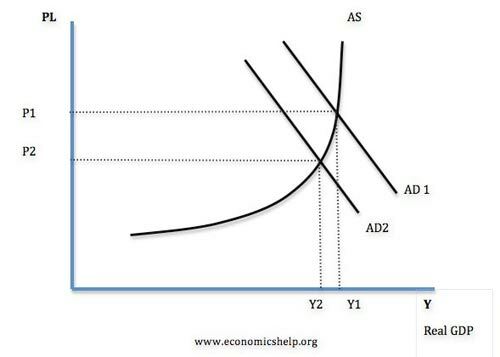 This is because, with deflation, we are more likely to get conditions of falling aggregate demand. If conditions are met, then cutting marginal tax on labour will increase labour supply, reduce wages and could increase unemployment. Higher minimum wages in a recession may be quite effective in boosting demand. When interest rates are zero, policies designed to increase aggregate demand, e.g. higher government investment may be particularly effective – more effective than under usual interest rate conditions. The theory assumes flexible labour markets, but wages are often sticky downwards. Even in the great recession of 2008-12, we often saw nominal wages resistant to falling. Therefore, even in a liquidity trap, at the zero bound rate, an increase in the labour supply does not necessarily reduce wages. Central banks have proposed the idea of negative interest rates. In theory, this can overcome the problem of rising real interest rates at the zero bound rate. In the 2008-12 recession, the Federal Reserve adopted aggressive monetary easing (Q.E) which prevented deflation. This meant even though we had zero interest rates, all conditions were not met. Combined with flexible labour markets and absence of deflation – UK and US saw surprisingly resilient labour markets (lower than expected unemployment) despite being in a liquidity trap.